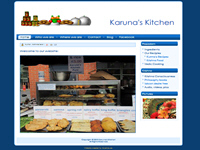 The official website of Karuna’s Kitchen, Dublin. They sell savouries or finger foods, vegetable and chickpea curry, tomato and panir subji, a selection of 5 Indian chutneys, etc. Category Restaurants July 12, 2012 by ISKCON Desire Tree.